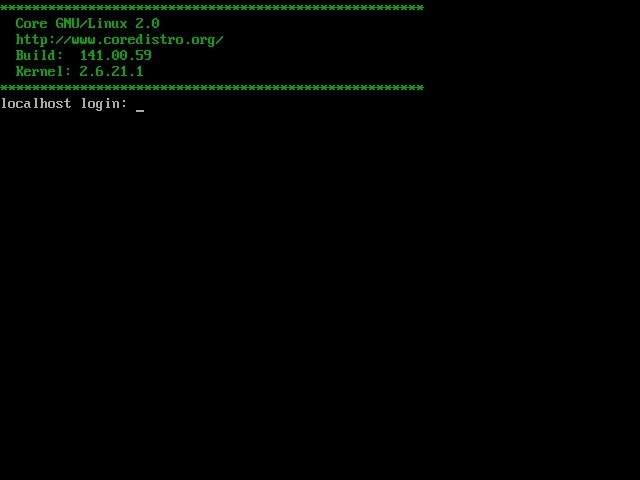 Installing Core Linux is covered in this article (on the front page of coredistro.org as it happens!). The descriptions are clear; however, we will expand on the instructions listed there. Log in as root (which has no password). First, figure out which disk to work with. The disk is most likely either /dev/hda (first IDE drive) or /dev/sda (first SCSI drive). You can see whether these disks exist by searching dmesg for sda and for hda. The -j option creates what is commonly called an ext3 partition – which is in reality, and ext2 partition with a journal file attached. But that’s another post. Next installment… setting up grub. If you want to create your own Linux distribution from scratch (and learn a lot during the process), you could do no better than to start with Linux From Scratch. However, many of us will not want to go to the extremes that LFS requires: there is an alternative – Core Linux. Core Linux provides just enough of Linux to boot into a shell and compile. Thus it comes with bash and gcc and associated tools. If you want Apache – or PHP – or X11 – or KDE, you’ll have to compile itself – which is the point. Core Linux comes in a small ISO, and provides a small shell script to install the basics of the system. The ISO is 150M and is available from Sourceforge. When you burn the ISO, don’t forget to use the image capabilities of your CD burning application; don’t copy the file into a CDROM directory – but then you knew that already, didn’t you? In upcoming parts of this series, I’ll show you how to install Core and how to get started with some applications. Of course, if you can’t wait…..
Downtime is inevitable: servers need to be updated, patches applied, hardware upgraded or fixed, and so on. But how do you choose when to take the server down (if you have a choice)? First of all is to ask the affected users of the system. This can range from getting the supervisor or person in charge to give an OK to having meetings with all affected. In some fashion, the users who are affected need to know and need to have input into the best time to take the server down. When the server is down, they may not be able to do much of their work; minimizing impact on them is important. To also minimize impact, the downtime can often be arranged during off-hours. In the U.S., this is typically outside of the normal workday of 8 a.m. to 5 p.m. (800-1700). However – if the server is in use in other time zones, this window gets bigger – and if the server is used world-wide, the window gets bigger still. The other thing to think about is which day to take down the server. One can do it during the work week (Mon. through Fri.); however, all of those nights (except Friday) are constrained by the fact that the availability deadline would be something like the next day at 7:00 a.m. When downtime is scheduled for Friday night, there are two entire days more to get things right. If a downtime is necessary for a major upgrade or extensive changes, then scheduling for Friday night gives that much more time to get everything working before Monday morning. Planning for a disaster is not necessarily as easy as it sounds. It helps if you have a rampant imagination. Throughout disaster planning, the dominant question is What if…? Following the planning, testing is required: the best plans are worthless if they don’t work in practice. What if… a disk goes bad? What if… the software stops? What if… memory runs out? What if… the power goes out? What if… the kernel panics? What if… the cluster failover fails? What if… the network switch fails? What if… the network firewall fails? What if… the internet link goes down? What if… the internet provider drops off the grid? Each one of the questions must be answered and the results tested. To test for power outage, pull the power. For a failed network switch, pull the network cable – and so forth. Most of the answers will include some form of redundancy – clusters, dual facilities (such as power and network and internet providers), and so on. However redundancy is only one solution; there is prevention and alerts as well. Each risk must be weighed against the cost to mitigate that risk. However, assuming that the risk is minimal does not eliminate the risk; the biggest problem is not accounting for a risk that eventually happens. There is nothing like downtime of a critical server to get an unforeseen risk taken care of; better to handle the risk before it happens. It also does not matter if the plans have not been tested. If tests are not done, then the actual event will be the first time things have been put to the test – and what if something was missed and the system goes down? During a test, preventive measures can be taken to make sure that things work as they should – during an unexpected event, it is not possible to back out or prepare; if things go down they go hard. Don’t let that happen to you! And disaster planning is not limited to servers (or virtual servers) – what about the possibility of a server hosting multiple virtual servers going down? What if your server is hacked into? What about your monitoring system failing? What about getting paged? Have you planned contingencies for all of these events? Plan, then test, test, test – and you will make it. The utility lsof is a relatively new (well, compared to UNIX anyway) that has more options than even ls. These options provide for some extremely powerful capabilities, some of which we aim to illuminate here. This lists, as desired, all TCP/IP sockets held open by perl processes. The utility lsof is indeed very useful, and reading the man page for lsof is recommended. It’s one thing when your missus (system administrator geeks are almost always guys – almost) wants to know what you do all day – what do you say when your boss wants to know what you did all day? You best have a suitable answer! This is yet another benefit to the GTD maxim: Write it down! But it’s not just from GTD. Researchers will say If it isn’t written down, it didn’t happen. Lawyers say A verbal contract isn’t worth the paper it’s written on. Details matter. When you write something down, in the words of David Allen, you get it out of your head. You don’t have to try and remember everything your boss asked you to do: you’ve got it written down. To follow through with the GTD method, you should write down the Next Action: what is the very next thing you have to do? Set up server smith isn’t good enough. How about: Configure Kickstart server for new server smith. Much better! There are a number of options to standard UNIX commands that are not necessarily well-known or widely used. As your expertise grows, these lesser known options can speed up your processing considerably, making you more productive. For example, there is the ls command. Of course, ls may have been the first command to list as a bug: “Has too many options.” However, many of these will help you if you remember them. To list files one per line, use the -1 (one) option. This can be useful to override default options or to force a plain and generic single column output. To list all arguments as if they were files, use the -d option. This doesn’t sound like much at first, but can be very useful. The best example would be a listing with a wildcard in it: the shell expands the wildcard, then any directory in that list will have the files in it listed in the output. For the cleanest output, use the wildcard as desired and add the -d option: this will prevent ls from listing the directory. If you want to see if two different files are the same file – i.e., hard-linked – use the -i option to list inodes. The inode number for a hardlinked file will match for all of its links. For looking for manual pages, use the -k option to find all man pages with that specific topic in the header. The topic is specified as an argument. For example, see what man -k wireless gets you. Gzip is another one with some useful options. The most useful gzip option that is perhaps not widely used is the -c option: this will generate the output onto the stdout stream – which permits it to be piped into another program, such as tar. Since gzip and gunzip are the same program (with different settings), the -c option can be used for gunzip as much as for gzip. The make program also has some handy options. One particularly useful option is -C: when specified with a directory, -C tells make to change to that directory before running. This means you can run make from anywhere and tell it to act on a makefile somewhere else. For example, how about this for NIS map management? It doesn’t matter where you run that from, it will work. The sudo program has some very useful options. When you run sudo, you trigger a five-minute countdown (or whatever time is set in the configuration). When this time runs out, you are asked for your password again when you run sudo. However – the -v option allows you to restart that clock from the beginning, entering your password if necessary. It also does not take any commands to run (as that would be superfluous). The -k option to sudo can be just about as useful: the -k option stops the countdown and resets any clock back to zero. The next time you use sudo, it will ask for password. A disk snapshot is a snap in time, a picture of what a disk looked like “back then”. This can be very useful for maintenance. For example, being able to freeze a Caché instance, take a disk snapshot, then thaw the Caché instance will permit you to take backups or copies of a Caché database with minimal downtime. The first file system presented in the command line is key: it is the source of the snapshot. Note that it can be either a device or a current mount point. The second (device) is a filesystem prepared to hold a snapshot, and the last is the usual mount point. Once this is done, the normal filesystem can continue to be used while the snapshot retains the older data as it was taken. In the example above, /var/cache/db could be used normally while the snapshot resides on /snap. If there was a directory /var/cache/db/db01 then there would also be a /snap/db01 available as well. One caveat is that as long as the snapshot is mounted and in use, the changes to the original filesystem are being saved – it is possible that the snapshot volume can run out of space. When this happens, you will receive what may appear to be mysterious disk full errors unless you realize what is happening. So don’t keep your snapshots around forever. The PWN to OWN Contest is a hacking contest at the CanSecWest security conference that pits a standard install of Linux, Windows, and MacOS X against all comers. Each laptop has a default installation on it, and has not been hardened at all. The successful hacker will not only win a cash prize, but the system in question as well. The MacBook Pro was the first to fall, and the laptop running Microsoft Vista Ultimate second. However, there will be those that misinterpret the results by not realizing how the contest was conducted. Each contestant gets 30 minutes to attempt to crack the machine, and can choose which machine to attack. The attacks are limited by the rules, and each day that went by the rules allowed a wider range of attack vectors. It was a third party application (Adobe Flash) that permitted the compromise of the Microsoft Vista machine. No part of the contest can be considered a scientific study into which system is more secure than the other: contestants attacked a single machine of choice, and contestants were allowed their attempts one at a time – and the operating system was not hardened. This is entirely different than, for example, the Capture the Flag contest at DEFCON. That contest consists of setting up a server and trying to capture the other teams “flag” through compromising the server in some way. In that contest, any and all comers are permitted to enter and to attack at will during the contest with whatever vulnerabilities and methods they have available. Speaking of DEFCON, DEFCON 9 saw the entrance of an Alpha-based VMS machine – installed with the standard setup – which remained unscathed throughout the contest, though try they did. The VMS Team (the Green Team) had a writeup and also wrote a white paper afterwards. If you are interested in DEFCON, DEFCON 16 will be August 8-10 in Las Vegas, Nevada. Also, speaking of DEFCON – let’s not forget the similarly named but totally unrelated InterSystems DEVCON2008, which is just wrapping up. DEVCON, among other things, covers Caché development and related. It is interesting to note that InterSystems DEVCON began 15 years ago, whereas DEFCON began 16 years ago. I wonder how much Caché security is covered at DEVCON2008.